It's 1:00 on a brilliant Monday afternoon in late October. Harvest is still in full swing in the Santa Lucia Highlands. Sabrine Rodems is waiting in the tasting room, wearing galoshes and a nervous smile. My timing for a visit is less than perfect. There are twelve wines lines up on the tasting table and she's got a million more important things to do in the winery. But you wouldn't know that this afternoon. These wines are her craft. She's proud of them. And as I'm about to find out, she has every reason to be. 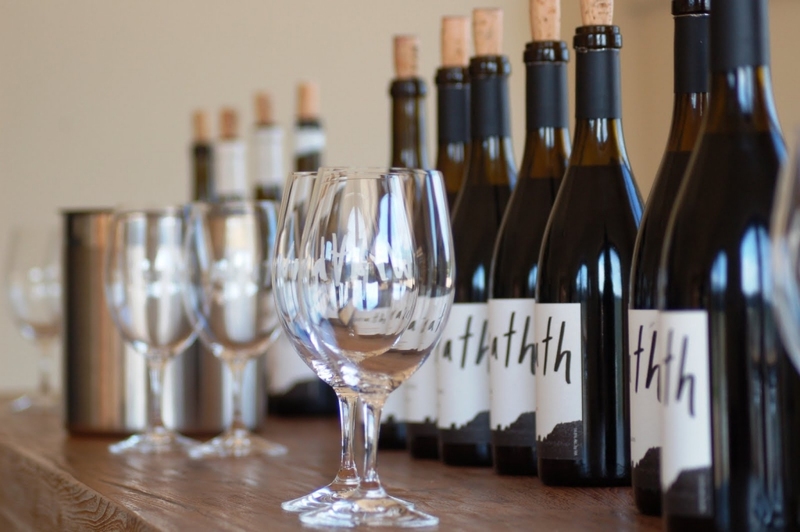 Wrath is one of the few wineries with a formal tasting room in this region. Roomy and open, large wrap around windows look out onto an irrigation pond lined with tall reeds and an occasional heron. Sabrine has been the winemaker here since before the winery the takeover and rebranding by the Thomas family in 2007, so she knows the vineyards well. She has a barely contained energy that is either the result of endless pots of harvest time coffee, or an enthusiasm that could only come from loving a job that requires endless strings of all-nighters two months out of the year. Thirty minutes for fourteen wines is a blistering pace - as indicated by the brevity of the following tasting notes. But there's a similarity to these wines - the Pinots in particular - that's worth lingering over. First, while stylistically not every one of these wines does not strike a chord with my personal preferences, they all hit their respective marks based on Sabrine's targets. The Ex Anima Sauvignon Blanc, for example, is decidedly New Zealand in style. Why extract New Zealand from Monterey county? For power and elegance, she says with an intent gaze and quick laugh. More than just getting what she wants from the grapes, there is a clarity and laser beam-like focus to the reds expressed in a linear thread of acidity and tannins. Despite a production of just 3200 cases, Wrath bottles around 20 different wines, 9 of which are clonal or vineyard designate Pinot Noirs - no surprise given the quality Pinots enjoy here. Sabrine is aggressively experimenting with whole cluster fermentation to highlight the light that shines in her reds. With almost catalog-like recall, she fastidiously recites cluster ratios for the wines we're tasting. That fastidiousness is reflected in these wines. Above all else, they are incredibly well executed. Stylistically, the whites vary a fair bit (see notes below). But a commonality emerges tasting through the Pinots and Syrahs. Precision is clearly valued over extraction. Balance and nuance wins over bravado and obviousness - though there is plenty of power under these corks. Elegance is pervasive. And there is a certain confident femininity to these wines that makes them special. There is no need or presence of winemaking parlor tricks here, just faithfulness to the vineyard and winemaking values. In summary, this line up easily represents the most transparent and well-defined illumination of reds in the region. Wine lovers looking to graduate to a new level of cool climate Pinot and Syrah appreciation take note (especially to the asterisked wines)- and keep on the lookout for this label. **** denotes favorite of the flight. 2010 Wrath Ex Anima Sauvignon Blanc, Monterey $19New Zealand in Monterey county. A touch hollow, but expressively citrusy and with a sharp, crisp edge. 100% stainless. Roly-poly round, fat, and loose. Simple, if gulpable. An outlier in this lineup. Oh, lord. Here we go. This is great! Full blown, almost over the top, but somehow still elegant. Insanely delicious. Strong, strong gold color. Perhaps the biggest Chardonnay I've every had. Anywhere. Period. Huge linebacker that pulls it all off with terrific structure. Lean nose, lean body, acidic, and young. From 3 year old vines - and you can tell. Needs more time in the bottle, open, or both. Softer and bright, but still with a blunt acidic component. Also needs time to reveal its goods. Fruit forward with smooth texture and rich cola notes. Acids relax and so does the drinker. Lovely. Say hello to Pommard in California. Wow. Uncanny. Unreal quality and focus. So dense it's hard to believe it's Pinot. Fantastic. Massive. Enormous. The Pinot counterpart to the Fermata Chardonnay. Size is balanced by deft structure and delicate backbone of tannins. The exception to the rule. Highly extroverted. Flavors and style consistent with Tondre's own bottling reviewed here. Stainless. Expressive, loud, and jazzy. Lovely texture. Will benefit from some time to unwind and uncomplicate its tempo. Bring on the funk! (Who doesn't want the funk?) Seamless texture, terrific nuance, but also needs time. Great savory character. Sensationally refined, beautiful focus. So delicate for a Syrah, yet massive in its structure. This is what cool climate Syrah can - and should - be. Holy moly! This is Syrah?!? Exotic flowers meets button down shirt in this fantastic, incredibly expressive example that shows off like a Pinot.